Chas King the King of Cycling. Chas was a life member of ACTA, a Past President, and when he lived in Auckland he was a member of the Wednesday Riders – a select group of those who are retired, unemployed, self-employed or just layabouts. There was the late John Dunbar, the late George Garside, Arthur Sharp, Arthur Westaway and Chas. Rather like the Famous Five with Last of the Summer Wine overtones! The legs said it all. Sometimes there would be a cry from the group “ last one to the tea-rooms buys the tea”. The king’s legs ensured he never paid for the tea. He was invincible in the tea-rooms sprint. His contribution to cycling yarns was delivered with that wry London sense of humour that was enjoyed by all. It manifested itself at one AGM when Chas was president. As at all AGMs it is customary for Hon. Pres. to present his report. As chairman at the time, I asked Chas to give the presidents address. And sat down. End of report! ACTA AGMs are not big on pomp and ceremony. The BBQ that goes with them and more cycling yarns are more important. bemused that the New Zealand Herald should take such an interest in him. After all, at the time he was only in his late seventies. Arthur Westaway will vouch for this and especially for the beautiful young reporter that the paper sent out. Chas rode round Taupo many times as part of the annual charity 100 miler. More often than not he was the oldest entrant and always did a very creditable time of about 7 or 8 hours, This always included a couple of stops for tea and buns. Chas was riding up until about a year ago around the Cambridge area and after one little spin of about 70 kms remarked that he must be losing his touch a bit he had to walk one of the hills. Most of us half his age would walk up! I spoke earlier about being a satisfied customer. I refer to Chas King’s bicycle frame building expertise. As a testimony to their popularity, you will always find them on an ACTA club run. Many a time it is the only brand being ridden on the day. I well remember a Te Awamutu weekend when we were about to start out for the day and all fifteen of us noticed we were on Chas Kings. On a personal note our Chas King tandem, now 14 years old has been on four trips to UK & Europe, Australia, the Pacific Islands and around New Zealand. It has never missed a beat. We have, but not the tandem. About 5 years ago Chas made me a solo bicycle. I think I am the proud owner of the last one off the factory production line. Chas told me that there had been a lot of union problems at the factory so he had made all the staff redundant. The factory at 36 Gilliam Street in Chas’ garage was closed. The Managing Director was moving to Cambridge to do a little more cycling. 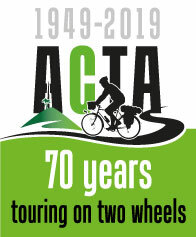 ACTA has lost its oldest member and in many ways its most prolific contributor to our cycling enjoyment. To Joan, Ian Sheila, David and families our condolences and to Chas thanks for the wonderful memories.